A Flash Mob was organized in Egypt last week by the Facebook fan page, We are Khalid Said. The page was formed in memory of Khaled Said who was brutally tortured and killed by Alexandria police on June 6th. According to AP, he was killed "after he posted a video on the Internet of officers sharing the spoils from a drug bust among themselves". By all accounts the 'Silent Protest,' as it is called on Facebook, was a resounding success in Alexandria. Stories from the ground, including pictures and videos, are flooding the Facebook group. There was a public outcry after pictures of Said's mangled face surfaced on the Internet. Protesters, gathered near the Ministry of Justice in Cairo, were met with the usual show of extreme force, during which Ayman Nour, a well-known opposition leader, was injured trying to protect his son from the police. Pictures of the authorities dragging protesters away disseminated overnight on Facebook. AP reported that "Security forces, some of them in plainclothes, beat protesters and knocked some to the ground. They put them in headlocks and handcuffed them before dragging them off to waiting trucks for arrest." "if speaking up only brings more violence, then silence will have to articulate our grief." At 6 pm Alexandrians dressed in black and stood facing the ocean in complete silence, some in prayer, before marching away single filed. The Rules of Engagement for the protest, which were posted to the Facebook group on Thursday, attempted to maximize impact while minimizing violence by avoiding Egypt's stifling Emergency Law. The rules instructed participants to stand 5 meters apart therefore circumventing the ban on public assembly. This could be the tipping point for Egypt. The escalating brutality of the Egyptian police has resonated in the US. At the State Department daily briefing, Assistant Secretary Crowley indicated his concern over the death of Said in Alexandria, and urged "the Egyptian authorities to hold accountable whoever is responsible." Similar protests are planned for London and Washington DC. The opposition movement may be reaching a critical mass; unfortunately it came at high price for the Said family. Only time will tell if this builds into real and lasting political change, but it seems to be a clear sign of the percolating resentment on the Egyptian street. 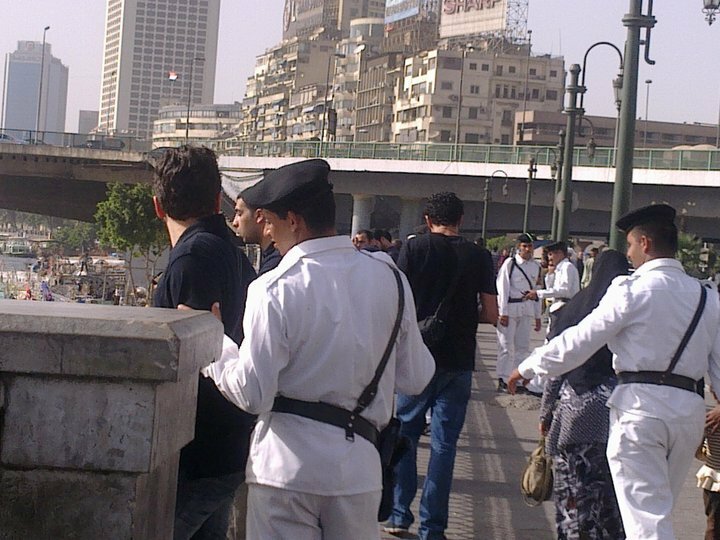 We tried to organize a similar silent non-violent protest in Cairo, on the same day and at the same hour to show the world that the Egyptian youth are all united against the brutality of the Police, but we were annoyed and pushed away by policemen saying that it is "not allowed" to stand wearing black on the banks of the Nile. Can you imagine how far they are going?! The effort was noticed. And pictures made it to Facebook.